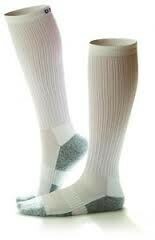 Built to last up to 4 times longer than ordinary socks. Made with Bamboo Charcoal Fibers for their special moisture wicking and anti-microbial features. Seamless construction and extra padding. A MUST for diabetics - great comfort for all! Safe for people with diabetes, following surgery, during and after pregnancy and when traveling.